I am trying a new comfort food for lunch today, Pakura. 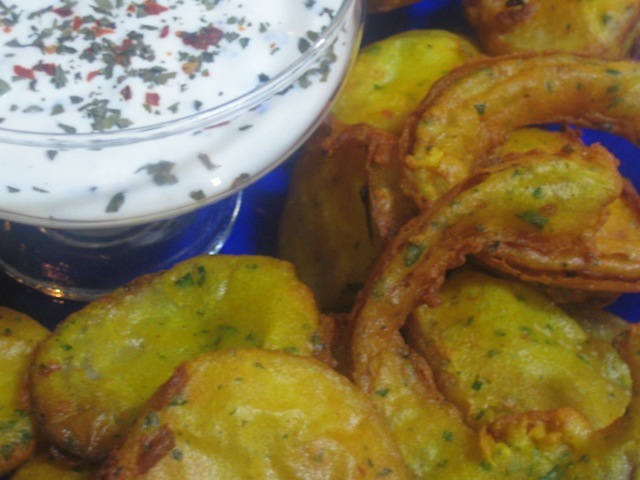 This is a traditional Afghan appetizer, or snack food, which is similar to Tempura in that you dip your vegetables into a batter, then deep fry. We rarely deep fry anything, so I just sent Spice to the store for some more oil. This will mean double cardio duty at the gym tonight, but if they turn out anything like what I've tasted before, it is all worth it! Begin by par boiling 4-6 medium potatoes in salted water for 12 minutes. (Clean off any dirt before beginning). Take them out of the hot tub, and let them cool for about 30 minutes. Remove the skins, and cut into 1/4 inch thick slices. If you are using additional vegetables, prepare by cleaning and slicing as necessary. You may use anything from broccoli, cauliflower, eggplant, or sliced onions, which we will experiment with today. While your potatoes are playing in the hot tub, mix 1 1/2 cups of Garbanzo Bean Flour with 1 Tbsp. of kosher salt, 2 tsp. of crushed red pepper, 2 tsp. of garlic powder, 1/2 tsp. black pepper, 1 tsp. of turmeric, and 1 Tbsp. of finely chopped cilantro. (You may substitute ground cilantro seed if that is in your pantry). Add 1 cup of water and stir the batter well. You will need to give this the "sticky test" as I call it, making sure to gradually add your water until you get the right consistency for dipping your vegetables. Remember, it is always easier to add water than take away. Let the batter sit until you are finished preparing your vegetables. Next, heat your vegetable oil on high heat, and watch for it to "smoke." You'll know it is ready to welcome the vegetables at this point. The vegetables should rise to the top as they finish cooking. Lay on a platter lined with paper towel and drain. Transfer to a serving platter. We enjoy these with yogurt sauce for dipping. Mix some Greek yogurt with a little milk to thin, and if you have Labne, add a spoonful. Sprinkle a little dried mint for flavor.